Cæsar's Camp near Farnham has been surveyed, with a report in this issue. This follows the surveying of the Winchester - Chichester Roman Road under Old Winchester Hill which found that the Hill Fort there had a series of Outer Defences enclosing some 30 times the area of the traditional ramparts. These generally form Fighting Terraces cut on sloping ground, with an assumed palisade on the down-hill side. This would serve to keep intruders out, but also to keep their live stock in. The important question is: are these general features of Iron Age Hill Forts? Thus we are looking at this Hill Fort at Farnham, starting with a survey of the traditional ramparts. News of this work reached Social Media, producing a number of local people who wished to learn more about it. We ran three tours over Autumn 2017. Some have joined in our study of its Outer Defences. 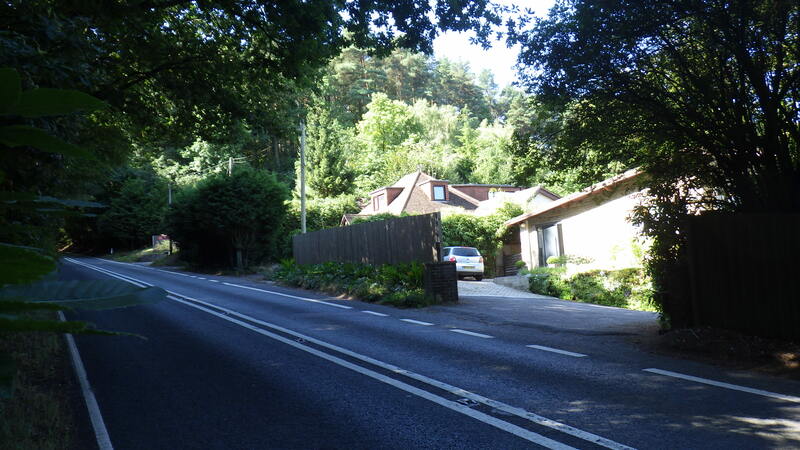 There are a substantial number of terraces cut in the escarpment above the A325 on the E side of Cæsar's Camp, which goes into built-up Aldershot in the region of Alexandra Road. Here a rectangle of steep escarpments follows this Road. They can briefly be found on the SE side of Cæsar's Camp above Heath End - but illustrates the problems we face with a great deal of quarrying and army practise earthworks. Then housing developments come right up to the summit of the downs, and the trail is lost for the S side of Cæsar's Camp. The westerly escarpment, broadly along the Reading Road, B3013, will be the next place to look. Walk in June found many gravel workings obscuring what would be a very good defendable escarpment. 25 yds of fighting terrace was found right at the summit of the escarpment - which will be moving to the E side of the B3013. In July we found over 500' of terracing to east of B3013 up Beacon Hill, bending west to cross the hollow way of B3013. 0n the West side is a very steep easily defended natural escarpment. The route to join the above 25yds of terracing can be predicted. Where it goes north of Beacon Hill was located. Picture where the Outer Defences cross the B3013 Reading Road east of Ewshot. The line is along the high ground of fir trees in the sunlight above the houses. The B road is running in a large hollow way. The Outer Defences would have run across the hollow way, and bend north behind the camera running down Beacon Hill. In August we found 500' of further terracing along the track NE of Beacon Hill, then trail went cold. Further terracing was found round SW of Reservior No. 1. In September we will climb Parkhurst Hill. In September we found terraces up Parkhurst Hill before being lost in brakern. Where the trail went cold in August it was realised that the terrace may be running on the track - so the line could continue - but it is beginning to go too far north to get back to the Royal Pavilion (where the Outer Defences were last detected). The need is to see if a plausible route exists between Reservoirs 1 & 2, which we will attempt in October. In November found that any route around the Reservoirs will lead onto the high tableland on which Caesar's Camp stands, and will not link to those terraces along the A325. Bourley Road may have a lot of terracing and be the route back. We will walk NE from Beacon Hill to understand the lie of the land. To join the project, apply to be on the Field Programme.